We err as humans in placing either too much or too little focus on money. On the one hand, we can spend recklessly and damage our futures by locking ourselves in a cycle of debt. On the other hand, we can hoard money and focus on always having a growing savings account. Both positions are errors. Both positions place a person under the lordship of money. Both extreme positions must be avoided by the Christian, though likely there are a range of positions between the two poles which are acceptable. The tendency to err on one side of a balanced approach is part of human nature. As recent history seems to indicate, human nature is biased toward instant gratification rather than the delay. No doubt an anthropologist could explain to us that such a bias toward immediate gratification is a result of evolutionary heritage. No doubt our ancestors, they might argue, lacking refrigeration must have gorged themselves on meat before it spoiled. This natural and explicable urge would explain in logical terms the human bias toward immediate consumption. I struggle to accept such an explanation. First, I doubt some of the basic allegation that such social behaviors as inherited instinctively rather than largely learned. Second, I see a stronger explanation in the psychological reward of receiving something or consuming something. It simply feels good to get something now. Whatever the reason for the quest of instant gratification, it has deleterious results for many people in contemporary culture. A recent article in the Atlantic provides a testimony of someone who has decent earnings, but still lives from paycheck to paycheck. A week by week approach is reality for many more than just the working poor or the poor of any kind. Neal Gabler, who penned the article, rightly points to his own choices for his family’s continued struggles. At least mostly. Gabler notes that when struggling, his family failed to downsize. They made the choice to send their children to private schools, to live in New York City and later Long Island though his work could have been done anywhere. This led to his being in the large group of Americans who would be unable to cover a relatively modest $400 emergency. His choices paid a large part in the problem. In most cases, there are reasonable justifications for these decisions, but they led toward a state of seeming perpetual financial struggle. But some of his decisions were made by using an expectation of the economy that differed from reality. Gabler notes that the economic conditions have changed since his childhood. The economy has not seen the robust growth in wages of earlier days. In fact, as he notes, the hourly wage has largely stagnated since 1972. Despite this, the value of benefits has grown significantly. This historic expectation colored Gabler’s vision of future potentialities. Most of us expect to make more next year than we make this year. We expect to see our salaries grow due to cost of living increases and due to merit increases. But Gabler’s article shows the danger of counting on a particular future outcome. Before going on, I must submit two qualifications. First, I am not condemning Gabler for his errors. Given past history, expecting growth in income would be a fair prediction. Many have made the same mistake. Second, some sort of reliance of future income is reasonable. Otherwise very few people would take a mortgage of any length. The trouble is not that Gabler and others count on future earnings, but that they are too optimistic about the future. We do not know what tomorrow holds. However, we have pretty good evidence there will be a tomorrow. Put those two things together and we should, it seems, make reasonable and unassuming predictions about the future. Such cautious predictions about the future are what make the difference (often, not always) between a week by week budget crisis and a path to financial solvency. We cannot know the future so any expectation may be proved wrong, but it is easier to adapt to a brighter future than we expected than to rely on future growth in earnings. James cautioned his audience against expecting too certain a future. Some traditions have taken this passage and created a pattern of speech that adds the proviso, “Lord willing,” to every futuristic statement. That may be a helpful didactic tool to remind people that the future is depended upon God, but I don’t think it is necessarily the intended result of James’ instruction. James is teaching people to depend on God and not to rely on their own wisdom and plans for the future. This should lead us to be cautiously optimistic. When it comes to managing money that we have stewardship of today, it should lead us to ask whether God is providing for future needs with money that he has given us today. There are certainly many applications of the principle that James is teaching here. However, one of them should be that we should be cautious about spending tomorrow’s dollars today. God controls the future. He may choose to grow our income in a way that outpaces inflation. Or, he may choose to move us to a different vocation with a lower salary. In the end, we can trust in his providence to meet our daily needs, but we should not presume that his providence will include funding our present desires. As we steward the resources God has allotted us, we should be generous toward the Lord, but more cautious toward our own desires. God will meet all our needs, but he may not give us whatever we want. Don’t be that student at seminary (or any other institution of higher learning). Yes, I’m talking about that one. Every class has that student who wants to teach the professor and the whole class something. It goes like this: The student read this book. Or, maybe he’s read several books on a topic. Or, perhaps her pastor taught a series of sermons on a particular topic with a particular slant. None of these qualifies this individual as an expert. Remember this, lest you become “that student.” The reason students are students is because they do not have the knowledge or expertise that the professor has. This seems like a simple idea that would be clear to everyone, but educators themselves have allowed "that student" to continue to exist, in part, because they are too soft on ignorance. This isn’t entirely true. First, there was the time when a student raised his hand to ask where we could get the Internet Encyclopedia of Philosophy. I realize this was the first day of class, but that was an insanely stupid question. The professor did a remarkable job in responding graciously. Nevertheless the question was both asked and bad. The second kind of bad question is the non-interrogative question. This can take two different forms. Sometimes these “questions” can be phrased as comments that are long and rambling, after which the speaker adds, “What do you think?” That is, if they bother to make it a true question at all. These are usually designed more to demonstrate the questioners brilliance or to teach the audience something. Another form often taken by the non-interrogative question is the “bear trap question.” These are used when a student has a nugget of information––usually trivia––that they want to surprise everyone (particularly the professor) with. These questions are usually tossed out in ways that, whether intended or not, break up the flow of the lecture or discussion. More often than not, they end up making “that student” look foolish to everyone else, though wise in her own eyes. Fortunately for “that student” Scripture is silent on this topic. Or not. The reality that seems to escape the understanding of “that student” and his inbred cousins is that no one in the room is paying to hear him speak. Everyone that has paid tuition to sit in a class is expecting to gain insight information from a highly qualified professional, usually a Doctor, who has invested countless hours reading, researching, discussing, teaching, are writing about the topic under consideration. This means that the fact that “that student” has read a recent book is extremely unlikely to shatter the foundations of the professor’s worldview. In reality, since I’ve been hanging around the academic community for a while, I’ve realized that most new books just rehash old books. Therefore, in the unlikely event that I’ve actually read some new book my professor has not read, he or she has likely encountered the thesis of that book in a dozen books previously. The democratization of education has led to the feeling that everyone has an opinion that counts. Wikipedia, blogs (like this one! ), and growing ease of self-publishing (particularly e-publishing) lend credibility to quackery and foolishness. They also increase the popular misconception that one can make a contribution to any field of interest nearly instantaneously merely once one has done a little research. If you think this, you are wrong. Feel free to do your research, but please hold all comments and pseudo-questions until the end. This is part of stewardship of the education of you and those in the class with you. Far from being a mere rant by a student about his peers. I am actually hopeful that this discussion might change lives. Perhaps even yours, dear reader. 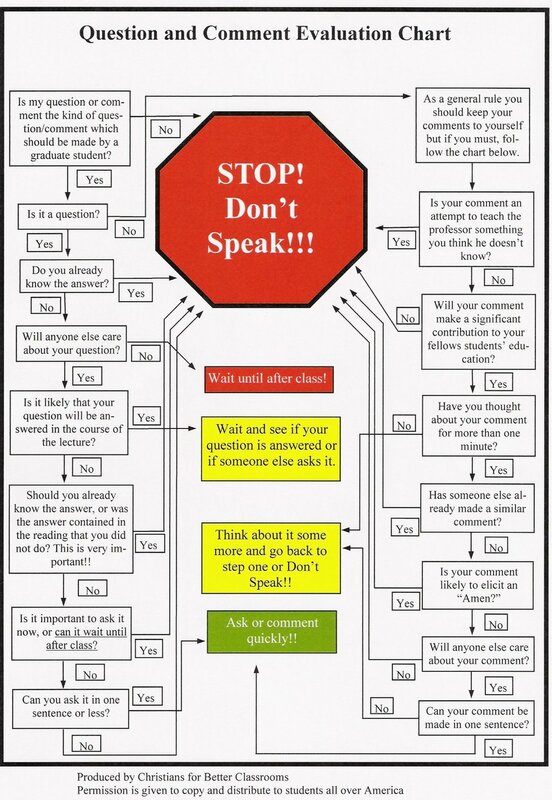 With that in mind, I’ve included this helpful flowchart for when and how to ask questions. This did not originate with me, but it is so important that it bears sharing across the world and among all generations. The moral of the story is not, “Don’t talk in class.” Instead, we should demonstrate neighbor love through our class participation. Only ask questions that will contribute to everyone’s understanding. And NEVER ask questions to show how smart you are. Most likely if you do, you’ll only end up looking dumber anyway.